Folded Business Cards is rated 4.2 out of 5 by 6. 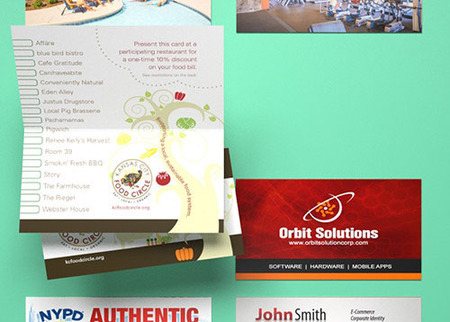 PrintPlace.com offers all of these options, so you can create the perfect folding business cards. "We can pack a lot of information into a tiny space and provide a life-saving tool for women in dangerous situations..the price point for folded business cards is perfect for us because we can distribute thousands for just a few hundred dollars." Rated 5 out of 5 by LindaG from Beautiful print job, as always. The client is thrilled with her new cards. Loved both how they look and how they feel. No surprise. Quick. High Quality. Best Price. Who says you have to pick just two? Rated 5 out of 5 by PamT360 from Nice job! Very easy to order. Produced in a timely manner and a great price, too!! Rated 5 out of 5 by Asuss06 from Always the best Been buying cards from printplace for many many years and I could never see myself going anywhere else. Rated 5 out of 5 by KVHearn from Excellent Cards I've ordered this type of card many times from printplace.com. the quality is excellent, and the price can't be beat. Need more room? Folded business card printing is the perfect solution. They give you space to include a photo or two and additional information about you and your business. You can even include a discount for new customers on the back without using valuable real estate. By folding business cards like this, you create cards that stand on their own. Standing a folded business card on a front desk or in a display proves more visible than laying a flat business card on a table. In a hurry? Folded business cards can be printed on a same day turnaround. For more custom options, fill out our custom order form, or call us at 877-405-3949, M-F (7am-8pm CT). When you print folding business cards, you get twice as much room. Since there are 4 panels instead of the standard 2, you can utilize the inside panels by including additional information or a larger graphic. Consider including schedules or charts that you frequently reference with clients. For example, you may be in an industry where conversion charts are used on a regular basis. Mortgage companies often reference interest rate conversion charts. You can also put local sports team calendars on the inside panels, so your prospects will have your information on the opposite side for the duration of the season. Folded business cards can also be used for miniature table tents or dinner place cards.